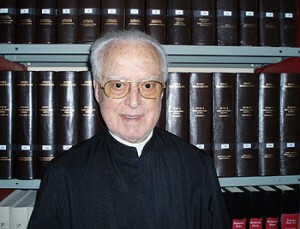 Father Roberto Busa SJ died on Tuesday, 9 August 2011, at the Aloisianum, the Institute of Gallarate (Varese, Italy). L’Osservatore Romano, the Vatican newspaper, aptly introduced its obituary with the headline: “Stop the reader, Fr. Busa has died”, highlighting his enormous achievements in the area of computer technology : “If you surf the Internet, it is thanks to him. If you jump from one site to another, clicking on links highlighted in blue, it is thanks to him. If you use a pc to write emails and documents, it is thanks to him. If you can read this article, it is thanks to him.” Other obituaries appeared here, here and here. We, who so easily use the online edition of the Corpus Thomisticum and the Index Thomisticus, would do well to recall how this gigantic work started in 1949! Father Busa tells his story in the foreword of A Companion to Digital Humanities, ed. Susan Schreibman, Ray Siemens, John Unsworth. Oxford: Blackwell, 2004.